Southern Smorgasbord | Food and Drink | Style Weekly - Richmond, VA local news, arts, and events. 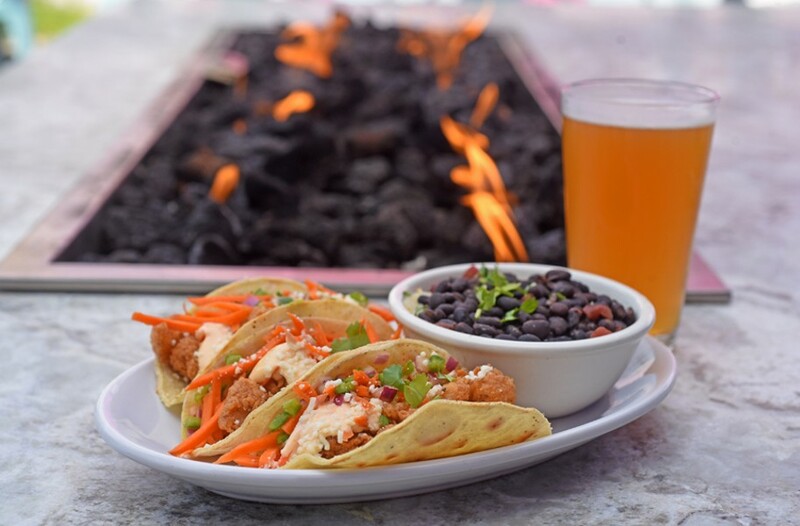 Scott Elmquist Served with a side of cilantro-lime rice and black beans, these tacos feature battered and fried gator with a tangy sauce. Kreggers at Hand opened last fall as the southern arm of Kreggers Tap and Table near Ashland. The exterior color palette — bright blue, fuchsia and purple — is a nice tribute, whether intentional or not, to the plethora of street art festival murals that once covered the old GRTC Bus Depot around the corner, now the Cary Street Station apartments. Immediately, the place tells you that it is young and full of energy. On both our visits, the crowd trended younger, probably a product of the location, great prices and specials. During warm weather, the outdoor bar and patio area is a welcome addition to Richmond's growing list of alfresco spots. Kreggers placed its Louisiana flair front and center during our first visit on Fat Tuesday. The jambalaya ($12) is part of the regular menu and the spice hit the mark, with a subtle mix of cayenne, paprika and cumin along with the usual suspects. It's always a positive sign when the kitchen doesn't need to drown out the taste of a dish with spices. Instead, you can easily appreciate the earthiness of the jambalaya and the acidity of the tomato. It comes with a cubelike block of cornbread that is sweet and cakey, with the right amount of crumble and the slightest hint of jalapeño. The gator tacos weren't on the standing menu at the time, but they were so popular as a special that they'll soon have a regular spot on the menu. The dish comes with three tacos and nicely seasoned meat, a bit chewy and buttery. They are dressed with a tangy, citrusy sauce that complements the meat well. A slight kick arrives in the second act, but a healthy portion of lime rice and black beans on the side helps any overheated palates. Kreggers' menu invites diners to "grab life by the beer" with a host of drink specials. On our first visit, the draft beers started at $3 depending on the amount of alcohol. It was great to see a number of Virginia beers from outside the Richmond area alongside the local favorites. During brunch service, mimosa carafes are available for $5, or for $12, you can sample a flight of mimosas. I was enticed by the blackberry lemon carafe. Unfortunately, it came to the table flat and without a hint of bubbles. I could taste the champagne, but the lack of bubs was a bit of a buzz kill. That said, no-fizz is fixable. The brunch menu is expansive. For starters, the table ordered pork belly doughnuts ($11.50), which quickly disappeared. Comfort food is combining bacon jam, Gouda and pork belly on a roll that you could eat any time of day. For main dishes: The chicken-fried steak and waffle ($12) deftly balances the savory flavors of the steak and gravy with the sweetness of the bacon jam and cornbread waffle. The waffle was especially memorable given its light and fluffy texture, plus the jalapeño pieces mixed into the batter. The combo is filling without being too heavy. The panchilada ($13) wraps scrambled eggs, bacon and sausage inside a very large pancake you can drizzle with maple-bourbon syrup. This dish is a belly buster. It's good, but prepare for a food coma if you finish it in one sitting. The home fries on the side pack a perfect crisp and saltiness when you need a break from tackling the behemoth on the plate. The turkey bacon Muenster ($10) on rye was sweet and salty, but it would have benefited from some mayo on one of the bread slices. The jam adds a citrusy tang while the turkey brings a smoky-savory feel. Untoasted rye bread isn't the best backdrop for the jam and some flavors didn't quite get along, but it's possible a toasted option would have eliminated the issue. For dessert, we tried the maple-bacon bourbon sundae ($6), which comes with a chunk of sweet jalapeño cornbread. It's light and should be shared. The bacon was sometimes a bit chewier than the dish called for, but still a nice way to close out a filling brunch. Kreggers is a crowd pleaser with a veritable smorgasbord of options at reasonable prices. The menu reflects a blending of places and culinary styles from the South, which seems permanently in vogue in Richmond, but it's also the story of the owners' peripatetic journey to Virginia through Texas and Louisiana. The pickiest eater among your party should be able to find a good meal here, and I especially appreciate that Kreggers has options to make many dishes vegetarian, gluten-free, or vegan depending on dietary needs. It's always good to see that flexibility going beyond niche restaurants into mainstream foodways. Thursdays-Fridays: 11 a.m. - 2a.m. Saturdays-Sundays: 10 a.m.- 2 a.m.